Q: Why is my display showing ‘0’ watts (or is very low)? A fairly easy mistake is to place the CT (Sensor jaw) around either more than one cable or a multi-core cable. The CT must be placed around the two main power cables, not the neutral cable. If you place it around both a main and Neutral, it will have a canceling effect or possibly a very low reading that doesn’t reflect the real figure. Q: How do I stop the LED lighting? If you don’t actually want a low rate tariff set-up: Press and hold the left UP button for more than 3 seconds, toggle between options with the OK button and note the rate. Press and hold both UP and DOWN buttons for more than 3 seconds, toggle between the options using the OK button and set the low rate to the same value as the normal. Q: Does the device need batteries? 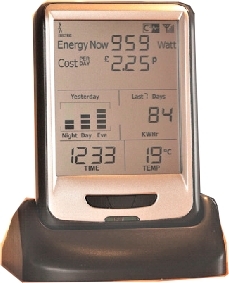 The Transmitter uses D Cell batteries (included) with an expected battery life of 7 years. The monitor comes with a power supply and a battery back option (for enhanced portability) is in the works. Q: Does the direction of the CT Clamp on the power line make a difference? IMPORTANT: Please run the driver installer and reboot your PC before plugging in the USB adapter into a free USB port on your computer. A battery back option for the monitor for enhanced portability) is in the works. Q: Will information be lost in the event of a power loss? All stored information (time, unit cost, and historic data) will be held in memory, although the clock will remain at the time when the power was removed. Q: Does it matter where I put the monitor? No, but it makes good sense to place it where it is often read, in a high traffic area, such as the kitchen. The radio signal from the transmitter should cover a distance of 100 feet, but solid walls and obstructions can affect this. Q: Do I unplug it when I go on a vacation? Depending on what your utility charges ~ About 2.5 cents per week. Q: Why do I see some dashes instead of energy (watts) occasionally? Q: Is it available in other colors? A White housing for the monitor is also available. Contact TruTechTools at 888-224-3437 or info@trutechtools.com for details. Q: Can I have more than one monitor (say for a study)? Q: Does it have to be professionally installed? No, the Current Cost device is not intrusive; this means that no electrical connection is made. However, it is good practice to follow the instructions issued by your utility company very carefully and if you are in any doubt consult an electrician. Q: How do I keep my monitor clean? Q: Are there monitors available for those with poor vision? The manufacturer is continually making improvements and changes to the product offering, they hope to have an ‘ audible alert’ version available soon. Q: Can I check my monitor while I’m away from home? The Current Cost monitor is equipped with a serial port for direct connection with a PC. Software currently under development will allow all sorts of communication. It is not good practice of course to leave your PC on (even in stand-by) while you are not using it. Q: Can I use it on my three phase supply? Q: Can I view data from months ago? Q: Can I use it if I am charged at two rates (eg. day and night rate)? Yes, the Current Cost monitor allows for two different day rates. Q: How can I detect faulty appliances? Keep an eye on the monitor when different appliances turn on and off, check the consumption against the manufacturer’s specification, it may differ slightly and older equipment are almost certain to use more. There will come a time when the appliance is using far more than it should and replacement should be considered. Q: Why is the energy used different than my utility bill shows? The Current Cost system is specifically designed to highlight areas of usage (and more importantly waste) it is not intended to replace or compete with your more accurate installed meter. It can complement your installed system by showing you what appliances are costing money now or recently, whereas your meter will show you accumulated usage. The Current Cost system receives information every six seconds; your meter continually records usage. Q: My energy cost rate changes if I use more than a fixed amount, what figure should I enter into the display? The Current Cost monitor is designed to highlight waste and is not intended to be a billing meter. The reason a cost is on there is to offer some relevancy to the wattage used. The best unit of measure to highlight waste is energy (expressed as watts) although money ultimately saved is an obvious benefit. A good solution, offered by a user is: Average your typical electric bills and usage so that you can have an average cost rate. I must admit you share a tremendous amount of information regarding Energy Monitors. Personally i will take care of every single word that you had mention over here. We don’t see anything on the horizon there, yet!